Oklahoma statutes define misdemeanors as any crime not punishable by imprisonment in a penitentiary or capital punishment. Misdemeanor charges can arise from a DUI arrest, insufficient funds for a check you wrote, a misunderstanding about merchandise you purchased in a story, a verbal dispute with someone in public, even a pet that gets out of your yard. A misdemeanor conviction in Tulsa courts can result in fines, probation and incarceration of up to a year in a county jail. Once a person is caught up in the criminal justice system, the process may spiral beyond their control. The outcome of a misdemeanor charge can have further consequences on a person’s life outside the legal system, inlcuding adverse affects on your employment opportunities. 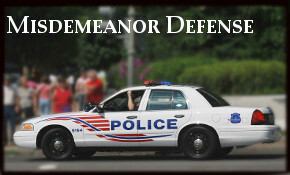 You need expert misdemeanor defense representation. If you are charged with a misdemeanor in Tulsa, it is important to retain a qualified Tulsa misdemeanor defense attorney as soon as possible to defend your legal rights. A misdemeanor case starts when charges are filed in court, but the legal system’s involvement in a criminal matter can start the moment an official begins to investigate an allegation. The report may or may not be founded in facts. If you find out you’re being investigated for a misdemeanor it can be important to seek an Oklahoma misdemeanor defense lawyer before you inadvertently implicate yourself or provide evidence prosecutors can later use against you. Police might not to read your rights to you unless and until you are arrested, but you enjoy the right to not provide evidence against yourself all day, every day. A qualified misdemeanor defense attorney can counsel you so don’t make matters worse, even when no charges have been filed. Once you’ve been charged with a misdemeanor it’s especially important get experienced legal representation. Consult a qualified Oklahoma misdemeanor defense attorney who knows the ropes. A defense attorneys can sometimes point out weaknesses that may convince a prosecutor not to proceed with a case. A skilled misdemeanor defense lawyer knows what to say and what not to say when speaking with opposing attorneys. A qualified misdemeanor defense attorney knows when to negotiate and when to stand firm, perhaps taking a case to trial and beyond, if necessary. One of our inalienable rights as Americans is the right to have criminal charges tried before a jury of our peers. That includes a right to a jury trial in some misdemeanor cases. Even when your case does qualify for a jury trial, Oklahoma misdemeanor defense lawyers will sometimes advise a client to seek a bench trial – a trial before a judge instead of a jury. With experience and knowledge of local courts, a Tulsa misdemeanor defense attorney can advise you what are your options and what is the best strategy in view of the particular facts of your case. If you would like a free consultation with a Tulsa, Ok, misdemeanor defense lawyer about pending misdemeanor charges, call the Wirth Law Office at (918) 879-1681 (or toll free at (888) Wirth-Law) or ask a question using the form at the top right of this page.